Hoping everyone has a beautiful & safe Labor Day... enjoying food galore, spirits, fun and of course the day off. Being a former Brooklynite, I remember the days of attending the Labor Day Parade on Eastern Parkway, full of color and excitement. Also recalling the days of participating in Jovert, which would take place the night before, partying til I couldn't party any more. With time and age.... a perfect Labor Day for me is spending time in my sewing room and enjoying the parade via TV. It was a good day. No big festivities for me. Just a good day. Glad you had a wonderful day too. Great minds think alike, I couldn't think of a better way to spend the holiday. Ours was nice too...we went to a movie as a family and did a lot of relaxing. Happy (late) Labor Day to you! Happy Labor Day to you. 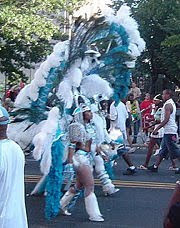 I used to go to the parade in Brooklyn years ago. Now I prefer go to the movies, the mall or simply hang out in my sewing room. I went to the parade. I hadn't been in years and since my son is old enough and much taller than I now, I felt it was safe. Masses of people, food, music. Rakkas!! That dress is baaaaaaaaaad!!! I love the fabric. Come to think of it. I think I have something similar but it black with olive green.